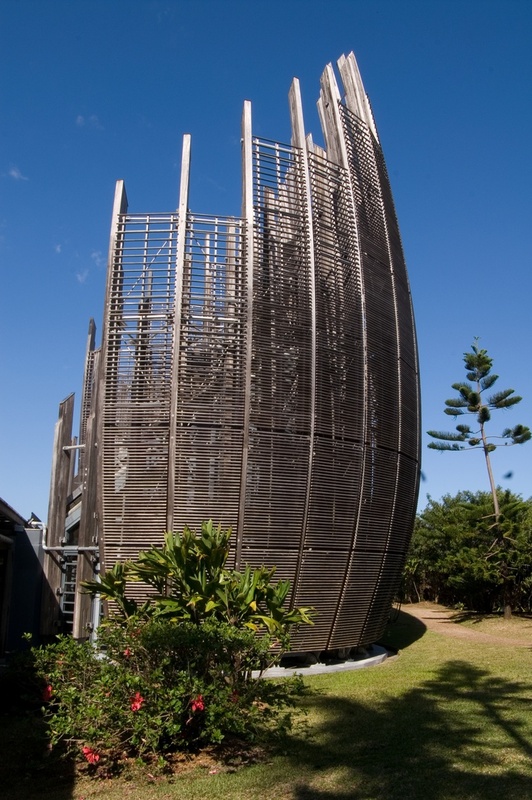 The Jean-Marie Tjibaou Cultural Centre, on the narrow Tinu Peninsula, approximately 8 kilometres (5.0 mi) northeast of the historic centre of Nouméa, the capital of New Caledonia, celebrates the vernacular Kanak culture, the indigenous culture of New Caledonia, amidst much political controversy over the independent status sought by the Kanaks from French colonial rule. It opened in June 1998 and was designed by Italian architect Renzo Piano and named after Jean-Marie Tjibaou, the leader of the independence movement who was assassinated in 1989 and who had a vision of establishing a cultural centre which blended the linguistic and artistic heritage of the Kanak people. The Kanak building traditions and the resources of modern international architecture were blended by Piano. The formal curved axial layout, 250 metres (820 ft) long on the top of the ridge, contains ten large conical cases or pavilions (all of different dimensions) patterned on the traditional Kanak Grand Hut design. The building is surrounded by landscaping which is also inspired by traditional Kanak design elements. Marie Claude Tjibaou, widow of Jean Marie Tjibaou and current leader of the Agency for the Development of Kanak Culture (ADCK), observed: "We, the Kanaks, see it as a culmination of a long struggle for the recognition of our identity; on the French Government’s part it is a powerful gesture of restitution."